C++ is a general-purpose programming language that supports procedural, object-oriented, generic and functional programming styles. C++ is deployed on billions of devices from the smallest embedded microprocessor to the largest supercomputer. Our mentors are friendly, experienced C++ developers who will help teach you new techniques and tricks. 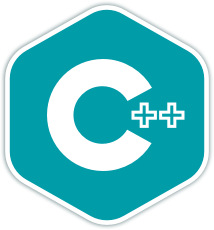 C++ (pronounced cee plus plus) is a general purpose programming language developed by Bjarne Stroustrup starting in 1979 at Bell Labs. It is immensely popular, particularly for applications that require speed and/or access to some low-level features. It is considered to be an intermediate level language, as it encapsulates both high and low level language features. C++ supports procedural, object-oriented, functional and generic programming. Compilers for C++ are available for essentially every platform, including Windows, Mac OS, and Linux. The standard for C++ is maintained by the International Organization for Standardization (ISO), and the current version of C++ as of June 2018 is C++17 (named not as the 17th version of C++, but rather signifying that the standard was ratified in 2017). The best thing about C++ is that it runs on everything from embedded processors with very limited resources to the largest mainframe supercomputer and every personal computer in between. Once you join the C++ language track, you will receive support and feedback from our team of mentors. Here are the bios of a few of the mentors of this track. These are a few of the 48 exercises on the C++ track. You can see all the exercises here. Get started with the C++ track. As with everything on Exercism, it's 100% free!